London’s Soho is a maze of cobbled streets and sneaky lanes that hide some of the capital’s best-kept secrets in terms of eateries and drinking dens, just off the well-trodden tourist trails of Oxford Street and Bond Street. One of the most enduring of these establishments is L’Escargot, a Soho landmark, which was set up in 1927 by M Georges Gaudin, the man who introduced the French delicacy of eating snails into London (he was even known to race snails in the basement), and quickly became a popular place among racy socialites and stars of the West End stage. As you enter the venue’s decadent doorway you can still see a bust of Gaudin on top of a snail alongside the motto ‘slow but sure’. Approaching the reception desk you are greeted by the famous faces of some of the restaurant’s past clientele, whose photos hang on the wall like trophies. 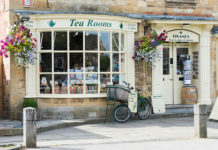 Rock stars such as Jagger jut out, alongside stars of the stage; Elton John, Coco Chanel and Dame Judy Dench are known to have eaten here, but one of the most famous regulars was none other than the late Princess Diana. In fact, in her book Eating Famously, long-serving Maitre d’ Elena Salvoni MBE, who was widely regarded as one of the best hostesses in London (and later went on to work at another Soho institution L’Etoile), tells the story of how Princess Diana arrived with a group of eight friends one evening unannounced and seemed to have a wonderful time but that the visit attracted unwanted press interest when it was suggested that the Princess was crying in the restaurant – something Elena strongly denies. L’Escargot is housed within a Georgian townhouse, which was once the private residence of the Duke of Portland. During Portland’s time the area was actually very rural and was a popular hunting ground; the name Soho is said to derive from a popular hunting cry of the time – “soohoo”. It was only after the Great Fire of London of 1666, when so many people were displaced, that the area began to be developed into a fashionable place to live. 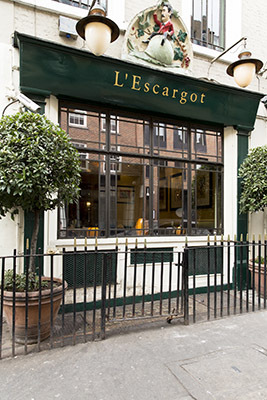 After changing hands many times, in February 2014 L’Escargot was bought by Brian Clivaz and Laurence Isaacson who hope to restore the restaurant’s reputation as having one of the best wine lists in the country. The downstairs dining room is elegantly decorated, with chandeliers delicately hanging above tables and while we opted for a table by the window to watch city life go by, we couldn’t help but wonder who might have been ushered into the booths behind us or one of the private rooms without our noticing. We started off our evening with an aperitif – Champagne, of course – before delving into the short but sweet menu. For starters we decided it would be rude not to try the house speciality of Snails Extraordinaire, which as expected were good (Gaudin would be proud), while for the main course we opted for the grilled lobster with garlic butter, and steak served with fries and L’Escargot’s famous piquant sauce. If you still have room after all this then we’d recommend the Creme Brûlée or a selection of cheeses, all washed down with a delectable dessert wine. 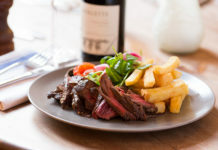 Talking of wine, that famous wine list (which consists mainly of French varieties, naturally) includes a good selection of half bottles or wines by the glass, or you can take advantage of the restaurant’s promise to provide one exquisite wine by the glass or carafe each evening at a very reduced price. All in all L’Escargot offers a nice taste of the glitz and glamour of this vibrant part of London, with a pinch of the old infused with the new, and a healthy dose of ooh-la-la. London’s boutique boltholes Click here to subscribe!